You all know we are huge fans of Land of Nod over here, so I am super excited to bring you all a giveaway just in time for the holidays! Through the end of the day, they are offering 20% off all ride on toys, which includes our very favorite toy ever, the This Little Piggy Rocker!! And we are giving one away to one lucky reader! Harper absolutely adores her pig, every day at naptime, she puts her tutu & headband on the pig while she sleeps, and always kisses it goodnight. Seriously, I think this toy will be in our family forever!! We got it for her at Christmas last year & she has loved it every day since! 🙂 All Land of Nod toys make me smile, the girls will be surprised this year with the Felt Fruits & Vegetables under the tree to go along with their play kitchen. They are really big in person, I think both girls will really love them! The watermelon & giant head of lettuce are my favorites. Aren’t these the cutest?! I would give this little Land of Nod piggy rocker to our baby girl who is almost a year old. Her daddy works in Seattle's Pike Place Market where there is a big pig statue in the center of the market. While daddy is hard at work near the big pig in the market, this little piggy rocker would be such a sweet friend to keep her company at home. I adore the Teepees they have! If we won the pig I would actually donate to the clinic I work for. We are a non-profit organization that sees low income and homeless patients for discounted and free services. We see a lot of kids and I think they would get joy from the piggy! Merry Christmas! We are in love with the teepees and this pig! I am a new mommy and would love to give this to our little one for our first Christmas together! We are in love with the teepees and this pig! I am a new mommy and would love to give this to our little one for Christmas! My little man would love the excavator ride on! He is obsessed with tractors! hands down, i am eyeing that sweet knit bowling set for the girls for a birthday gift for next year!!! although i think i might want the piggy just as much…great giveaway my friend! I love their Rainboat Wood Stacking Toy! I just had my first baby, a little boy, a week and a half ago, and I would love to get that (and save it for a few months) for him! The colors are so much fun! I love the pig! I would use it in the nursery for our baby due in 2015, so cute! I'm sure my 3 year old would love it as well! Love the pig for my co-worker's daughter! She would be thrilled! My daughter Ellie would love the piggy from Land of Nod!! Also, the teepees are super cute. Their teepees! Our lil man Hayes would love this PIG! Carson loves the pretend campfire playset! Land of Nod is HUGE at our house too! My sweet Harper Ann would love the Pig rocker!!! I would give the piggy rocker to my little girl. It's her first Christmas! I would love to give the ride on pig to my nephews (twin 16 month old boys), they would love it! Land of Nod has the best wood toys and blocks! I would love this for my daughter! My Averie would love this! Love Land of Nod toys, so classic. This pig would be perfect for my daughter Charlie. I've been eyeing that little piggy since you posted it last year! My 2yr old would absolutely adore that rocker, as would her younger sis ter when she's bigger(currently 8wks old). What a wonderful giveaway! The pig!! I would definitely give it to my daughter, Gianna. She is obsessed with pigs. We adoringly call our daughter little pig. This is perfect. I think she would love it! My 14 month old would loooove the pig! I absolutely love this pig rocker from Land of Nod along with everything they make. My husband loves all things piggy because he shared a likeness of pigs with his mother who sadly passed away from Leukemia when he was 13. Since finding out that we are expecting our first baby (a girl!) this March, he has been buying pig stuffed animals for our little lady because he hopes to share this bond with our daughter as well. I want to win this pig rocker so that I can give it to my husband for Christmas so that he can in turn give it to our daughter and continue the love of all things that OINK! I know it's a sappy story but hey it is the holidays after all! The piggie is by far my favorite, and it would go to my beautiful girl Isabella! The pig is just adorable! I would give it to my little girls, Sophia and Amelia for their playroom! I really like the Grey & White Dot Teepee!! I LOVE the play canopies! My sister in law is buying one for my daughter Tessa as the perfect reading nook for her room! Oh my Harrison would love a tent/teepee!! The piggy rocker would be perfect for my daughter, Easton! We love ordering books from Land of Nod. Our current favorite is My Friends by Taro Gomi. We would choose the pig!! My 14 month old little girl would love it!!! Plus I would love it if she won because our budget is tight this year. My daughter KataLina would LOVE this pig! Everything on land of nod is adorable!!!!! My little boy LOVES the teepees from Land of Nod!!!! Love that pig!!! Merry Christmas! I love Land of Nod's awesome selection of wooden and felt toys. They're awesome AND aren't bad on the eyes when they're strung through the house. 😉 The pig is adorable. I'd give her to my baby niece! I love the teepees from Land of Nod. So many cute colors and patterns. This pig is so adorable and I would give it to my sweet little boy for Christmas! My daughter would love the pig , our favorite toy would have to be the pig and the camper play tent. We love the teepees and would give this to our almost 2 year old!!! The piggy is cute, so is the little fire engine!! My daughter would love this pig! I would love the pig rocker for our sweet new addition to our family coming next year! I we we love everything from Land of Nod so it's hard to pick out our fav thing! This Little Pig would make the perfect addition to our loft for our sweet 2 yr old!! My two year old would LOVE this! We have the Land of Nod play home canopy which she adores. The Land of Nod seriously has the best imaginative and interactive toys for children of all ages. Looking at their website makes ME excited to play with some of them. I love the rockers (the little pig is absolutely adorable), but I think that if I had to choose a favorite, it would be the arctic rocker. The face of the polar bear is just too cute. If I won the giveaway, the rocker would be given to our little boy, who is due in mid-January! My daughter Gabi would love this pig!!! I love the pig and know my 18 month old twins would too! I love the arctic bear rocker! It is so cute and I know our new little baby will love it! I love the pig!! Our family adopted another local family who has small children. They cannot provide Christmas presents this year. I have already purchased most of their gifts and I know this would put an extra special smile on the kids' faces! P.S. I commented once but wasn't sure if I did it right. The pig rocker is soooo cute and would be perfect for my Harper, 20 months. But I also love the knit collection Ina Mermaid dolls, and we are gifting one to my other daughter's best friend! Love that piggy! It is my daughter, Maggie's first Christmas (she is 11 months old) and I would LOVE to give it to her! 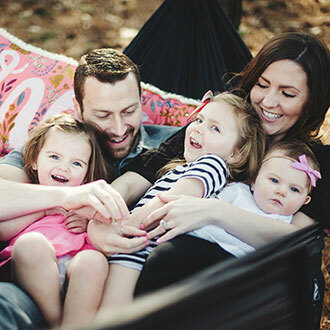 We already purchased a Land of Nod monogrammed chair for her – we love that place! We are obsessed with Land of Nod in our house. My most recent favorite purchase is the nautical themed toy bins!!! With that said, that piggy rocking toy would be so loved in our house. My 1 year old is obsessed with pigs. Merry Christmas!! I Love the pig, I went back and forth this Christmas to get it for my son but I just thought maybe he was too young this year. I would love to be able to get it for him next year. Love the Pig and so would my little boy! Not sure if it's too late to enter but my 2 1/2 year old girl would LOVE the pig!!! April and Violet knits dolls (blabla dolls) I do not think they are available anymore on Land of Nod, but they are my daugther's favorite. The one's name is Dolly and she is very very very loved, to the point, I tried to replace her, but it didn't work…..with the love and care from mom mom to fix her, she is still with us. She got her at 7 months old and she will be 8 in March!!!! I would love to get my 14 month old daughter one of the teepees! She would love it! She's into peek a boo and hinding so this would be perfect! My daughter would love this cute piggy! My family lives in a farming community and as such my daughter Susan is enchanted by all of the animals. This would be a gift for her and thus would allow her to play with and ride on the animals that her mommy otherwise (wisely) says no riding to. Yes, this mommy frowns on riding random live barnyard animals. We loved pigs in our family and although I would love to keep it I supposed I'd have to give it to my son. So excited for this giveaway! We have one piggy rocker but are in desperate need of another as a certain toddler will not share with her adoring sister! I would give it to our littlest who turns one in March :sigh:! I would love to give this pig for my son's first Christmas! This pig for sure, how adorable it is! I'd give it to my niece 🙂 thanks! My 2 year old daughter would absolutely love the pig! I'm in love with this piggy rocker! I would gift it to my cousin…she's due in April with her first baby! Love the teepee!!! I would give the pig to my daughter who turns 2 on Monday! I would giventhe adorable pig to my two year old! She would love it!! We have a set of colorful Land of Nod blocks that our almost two-year-old just loves. Had our eye on the piggie for her birthday in February. Zoey goes crazy for it when she sees it in the catalog. Yes. Our 22 month old "reads" the Land of Nod catalog! Such a character! the play hut is awesome!!! The pig is super cute too- both my kids love the show Peppa Pig, so it would be a hit! Our 2 year old would love the pig! My daughter would love this because she is already obsessed with her rocking horse and this is 100 time cuter (so I'd be willing to display in the house)!! I LOVE the pig! My 14 month old daughter would just think that would be the neatest thing! It would be such a blessing to receive it as a christmas present for her! I also love the Teepees that they sell, but unfortunately they are out of my price range. Have a great Christmas! My daughter, Hazel would love the little pig rocker! Shes about to be a big sister and could use something fun and new! This little piggy rocker is so cute! I would love to give it to my little one coming this summer! I love the gold door sheets at LON too! My 14 month old daughter would go nuts for the piggy rocker. We just bought her a teepee and she is obsessed with it! We love all lamd of nod stuff, but the piggy rocker would go to my oldest since she's obsessed with rockers. I love the fruit so much since I am a dietitian! The pig is adorable though and I would love to win for my daughter. Cailyn's current favorite toy is her Rainbow Stacker. She loves stacking all the rings onto the peg in any order she can. With a new addition on the way, I think The Little Piggy would make a perfect addition, and be loved for years to come! Growing up, pigs were my favorite animal, so obviously I love love the rocker! I was also eying the play food since we are making (crazy r us over here) a play kitchen for our daughter for Christmas. I mean the frozen treats…stupid cute! I know my son would love the pig when he gets a little older! I've been eyeing it for quite some time now! I also love the teepee as it was my favorite "toy" as a child! The pig rocker would be the biggest hit amongst the circle of cousins this year! I'd love to put this little piggy in my daughter's room for them all to enjoy! I would choose the teepee from The Land of Nod. It would be for my nephew and his soon-to-be sibling. His daddy is deploying soon so this would be a perfect little surprise for him. My little isla lovesssss pigs!! She does the cutest lil snort ever! I would give it to my son- he would love that!! And my daughter would too when she gets a bit older!! So awesome! Our boys have the sweetest little rocking horse already, but we would love to add some awesome felt food or stackers toys! Most definitely their wooden stacker! I love that pig!!! My daughter Alaina would LOVE it! Pigs are her favorite animal. We love the pig and would give it to our daughter who is almost 2. My favorite is the polar bear rocker! I know my son would love it! Ooooh I fell in love with that pig rocker when you first posted about it in Harper's room! Still doing some serious wishful thinking. The pig is adorable! Also love their teepees and play houses! So fun for kids! my daughter Zoë would love the pig rocker!!! we love everything at land of nod!! We are obsessed with Land of Nod! My oldest has the striped sleeping bag with the big pink bow and our littlest is getting one this year– along with the new doll sleeping bags that match! We love the teepees. Would love to win this little pig, pigs are all the rage at a our house right now. "Oink oink" is all here from my daughter as she is obsessed. So this would totally rock her world. This little pig is the cutest. It is one of my daughter's favorite animals. She would love saying "oink oink oink" while rocking away. I would love to win this pig rocker for my daughter it christmas, her birthday is coming and I am due with our 2nd in Jan. it would be so fun to win her this she loves rockers and pigs. The piggy rocker is our favorite but we definitely love all their toys! I would gift it to my son for his upcoming birthday! My 16 month old loves peppa pig. She would ADORE this for Christmas! Any pig toy/book she adores. Land of Nod has great toys. I vote this as my favorite toy or of course a teepee for my little book worm to read her books! Happy Holidays! That pig is SO adorable! I would love to give this to my 6 week old niece, Gemma, because we call her Gemma Pig. She makes THE most adorable piggy noises, not that I am biased 😉 Her big sister Eleanor (3 next month) would love to play with the pig too! I would love to give my 3 year old daughter the pig!! So cute!!! I love the camper tent & rainbow wood stacking toy… this pig is adorable too! Pretty much anything Land of Nod is good in my books! If we were to win – I know our 2 year old & impending sibling would LOVE it! I would give this little Land of Nod piggy to our little girl who is almost a year old. Her daddy works in Pikes Place Market out here in Seattle where there is a pig statue in the center of the market. So while daddy is hard at work near the big pig in the market, this little piggy rocker would be such a sweet friend to keep her company. Either the dump truck or s'mores set. Both look perfect for my 1.5 year old! The pig would be fun for my son or my best friends 2 year old daughter. What isn't there to love at Land of Nod?? I wish I could buy the whole store. My little Max would love the heck out of that little piggy. My babe would love this! Land of nod has so many adorable toys! I love the ride on excavator and I would give it to my new baby boy, of course he won't be able to play with it for a little while. Love all of the play food, the ride on pig and ride on excavator. Seriously too cute! I have a 2 year old daughter and 9 month old son who this would be perfect for! fingers crossed!! My 9 month old baby girl would love this for Christmas! I've had my eye on that pig since you got it last year! We just had a baby girl & I would give it to her because we are all about sweet and girly things as she is the first girl after several boys! I also really love the land of nod tepees and sleeping bags! That piggy would be a huge hit with our one year old little girl. Definitely a family heirloom! The pig is our favorite! I'd give that sweet pig to my four month old son for future play! I would just love to win this for my mini! I don't know if my other comment published /: I love all Lon stuff! I absolutely love this little pig rocker. Obsessed since seeing it under your tree for Harper last year. Now with a little one of my my own, I can only imagine how much she would love rockin' away on it! Her favs right now are the Nod blocks and her jumbo knit stacker from Land of Nod. Wishing you and the fam a merry merry Christmas! We would love this piggy for our little guy's first Christmas! He would love it! Love, love, love the teepee! Love the polar bear rocker for my baby boy. Love the pig! Will gift to my daughter Charlotte. She would love it!!! I've been eyeing this pig since last Christmas. This is definitely my favorite land of nod toy and would love to win it! All their toys are amazing but this pig and the doll pram are my top picks! Our favorite toy is our teepee, but we love everything from there including this adorable pig! I adore this pig! My two year old would love it. She's all about farm animals right now and I actually named her Charlotte after Charlotte's Web! We love love love Land of Nod it's where we got her bedding last year for Christmas! My favorite is the pig! I would give it to my three year old daughter Belle who absolutely loves rocking in my back! She would really love this! My daughter, Olivia, would absolutely adore this pig rocker! We have had our eyes on a Land of Nod teepee for a few months and are so excited to get one for our babe's first birthday in March. I know she would love the pig too…anything stuffed animal like is her jam these days! Our fave is the camper tent! I have been a fan of Land of Nod since my dear friend had a baby and used the store on her registry! Such a cute and classic store. I think the teepees are adorable and make a playroom extra special. I would love the pig to keep for when I have a child one day. 🙂 Thank you! I love the little piggy rocker, so precious! I'd give it to my best friends daughter. land of nod has lots of great educational toys. I love the wooden America puzzle! it's been on Charlies wishlist for quite a while. This is so adorable!! It is hard to pick just one! However I'm in love with the teepees!! And the stuffed fire set/s'more! I would love the pig! I would give it to my sister, in hopes of encouraging her to give my son a cousin soon! I love the box of musical instruments. My little guy would have so much fun! Love the pig! And both of my girls would go crazy over it! I love the pig!! I would give it to my son … & baby#2 (due in May:))! Love, love, love the teepees. And my 16 month old daughter, Paisley, would go crazy for a giant, rocking piggy!! My daughter would love the pig!! the pig is so cute!! My two year old would love it!! I would love to get my daughter a Teepee for Hanukkah! I am totally obsess with that little piggy! It is ridiculously adorable!! I would give it to my sweet little God son who is obsessed with farm animals!! Love love love the piggie or black/white tent for my little babes!! We just got a Land of Nod teepee and my son is obsessed! This little piggy wants to go wee wee wee all the way to my home! Lol. My 15-month old son would love this toy! My daughter Aubrey is 15 months old and I know she would adore this pig and have such a blast with it! We Love land of nod:) We also bought her a kitchen this year can't wait for her to get it on xmas morning, this would be such a wonderful addition! My daughter, Kinsley Grace, is 17 no. old today and would adore this rocker! This little piggy went to Land of Nod. This little piggy went home. My little piggy wished for a piggy rocker. My little piggy got none:( My little piggy cried "Wee wee wee!" all the way home! I have crushed on this rocker and the black and white teepee ever since you first posted about them! Unfortunately, it hasn't been in our "piggy bank"/budget. Our daughter, Lennon, would be so surprised if she received this for Xmas/birthday (Jan. 2nd)! What a sweet giveaway! My little boy would love this little piggie, you can never go wrong with land of nod! I also got my little one a little kitchen for Christmaskah so the little fruit and veg or something similar would be perfect! I'm sure both Ethan and the next little guy on the way would love the Piggy…so so cute! My 15 month old would love that pig rocker or a teepee! Elliot would love a pig. He loves when we make the piggy snort noises. I love land of nod! The tee pees would be something I would love for my little guy. And that pig would be something I'm sure he would love! His bedroom is filled with land of nod items because they are so adorable we would love to win! My daughter Zara would love a little piggy rocker. Too cute!! I would love the piggy rocker! I know my little one would love the pig! The pop up ice cream truck is amazing!! My 18 mos old son would LOVE the pig. Everytime he sees one he sings E-I-E-I-O! The pig is adorable!! I know my son would love it! That pig is darling! My babes would have so much fun with it. I'd say we would give it to my.9 month old daughter but I'm pretty sure her 3 year old brother would love it too! My boys would love a teepee! Our Sweet Emmalina and Baby Easton would LOVE the pig!!!! We would love the arctic rocker since my 2 year old loves zoo animals! Once she outgrew it, it would be perfect timing for my 6 month old nephew. I would give the pug to my nephew who is obsessed with animals! Would LOVE the pig! Have loved it since saw on your blog! And would give to my son! We love our Land of Nod growth chart! And my 16 month old daughter would love the pig!! The pig is my favorite! I can't wait to get it for my little girl. My sweet 18 month old GiGi would LOVE this pig from Land of Nod and will be a big sister like Harper in just one month! The fruit is cute, but I love the pig and would gift this to my 2 1/2 year old little cousin! With her imagination growing everyday,I can't wait to see what she would do with with fun fella! We would love one of these for our house!! I love the felt fruits and veggies! They would be the perfect addition to the play kitchen we are getting our daughter!! We love the tee pees! My favorite is the black and white striped teepee! My husband and I just found out TODAY that the little nugget in my belly is a girl….so I would be totally selfish and keep this little piggy for our future baby. You get to spoil the first one anyways, right? It has stood out in my mind since you first posted about it last year and I've loved it ever since! The pig rocker would be perfect for my Hank in the near future. He's only 6 months now, but growing toooo fast and will be ready before I know it. My daughter would loooove the pig! I would give this to my niece Claire. She is a bundle of joy who needs this precious piggie! My daughter would love the pig! Love the pig! Would love to give it to my 17 month old now and then pass it along to my 2 month old in the future! Our year and a half old daughter, Elliette, would LOVE the pig rocker! She's obsessed with animals and anything soft….she'd be in heaven! I love the croquet set but my daughter would love the pig!! I want the pig! I love non traditional items. We are in the process of moving to another city so when we have the new house I planned on filling it! I own an in home daycare and I know my kids would love this!! I would give it to my nephew, who was born THIS MORNING at 2:57 am. I was up at the hospital the whole time and I'm pooped, but I have to enter before bed! I would give it to him before Christmas because his room has a piggy theme! my two year old daughter adores ride on toys and may be peppa pig's biggest fan. she would be so happy to receive this sweet piggy rocker. we are big land of nod fans and really like all the colored building blocks they have! My son Ryan would love this! What a special gift! My favorite is the wolfgang amadeus jr piano! How can there be anything cuter than that!? Oh I have had my eye on that pig for so long! My toddler, Bella, would love it for Christmas! She also is really big into play food right now. I love all of Land of Nod's play food!! I love the pig! When I was younger, I had a rocking horse named Water…he was loved and cherished for many years. I think my kids would go crazy over a rocking pig, and I would love to hear the name they'd come up with! My little's current favorite is the FOX rattle – but little does he know, the STALLION ROCKER will be under the tree for his very 1st Christmas! I've had my eye on the RACECAR for his upcoming 1st Birthday at the end of January. VROOM! The pig is adorable!!!! I have some cousins that would love it!!! Love everything from land of nod from chairs to bedding…but our favorite is the teepee! My almost two year old would LOVE one of these pigs, or basically any other Land of Nod toy haha! Love Land of Nod!! Such an awesome giveaway! I love their smore's set. My boys would love it too. Oh the Pig would be wonderful. I love their stuff. My so griffin would be one happy little boy. I would love the pig for my 16 month old son!! My two peanuts would love this piggy to match their tee pee! I love the pig rocker and am sure my little girl would too! Love the pig! My daughter, Mia, would love it! Love the pig! My daughter, Mia, would love it!! I have twin boys and they can learn to share the piggy!! – Also, I am loving the jumbo knit stacker and the my first phone. Love the piggy! All of their stuff is great but I do love all of the block sets! Definitely the pig! My niece would love it! I saw this the other day on your IG and wondered where he was from, go figure! Love me some Land of Nod! My boys would love fighting over the big but we really want to snag one of the teepees! I love the pig and my 16 month old would go crazy and we would have to pull her off it I'm sure! I would LOVE to get a Tee-Pee for my kids! They would be so happy!! Land of Nod has the best stuff! Ah! We love the pig and all of the super cute wooden toys. Everything is always unique and such great quality! I LOVE the teepees but don't have room for one in our house! This pig would be a perfect gift for my daughter who will soon be a big sister and sharing her room! I would love this little piggy for my little piggy! I would give it to my 1yr old girl for Christmas! I love the pig rocker since you posted it last year. My two year old would love it and my six month old would be able to use it later too. We are moving into a new house soon and this would be perfect for redecorating her room. Fingers crossed! I think the tee-pees might be my favorite Land of Nod toy, but I know my daughter Hadley would love the Pig Rocker!! My daughter is farm animal obsessed and would love that pig. My little girl would go crazy over this! I love this pig. But I think my sweet boys would love the teepees even more! Pick me, pick me!!! I would love this piggy under the tree for my sweet 4 month old, Evelyn! I have loved pigs ever since I was little, would love to start an infatuation with her!!! Plus, then she can have something big brother and sister can envy. The pig would look fantastic for our new daughter in her nursery! I would give it to little unborn baby alexander of course! Love the piggy rocker! Almost got one for my daughter this year and now I'm seriously regretting not getting it! The pig is super cute! I am sure my daughter would love it! i would give the pig to my daughter! My favorite "toy" is their teepees and all of the rainbow wooden block toys 🙂 Thanks for the chance to win!!. I love the arctic rocker for my little guy! He is 7 months old and this would be the perfect toy to grow with him. My little one would LOVE the pig!! She is currently in love with my old rocking horse and is obsessed with all things "rocker". My daughter would love the polka dot teepee! The tepee that Land of Nod sells is my favorite. I love the RV tent! I looooove the pig!!! My daughter, Grace is only a few weeks younger than Harper. She would love this! I'll probably have to give it a try myself; if that doesn't work, I'll give it to my niece! I love the pig and I would give it to my son for Christmas! I absolutely adore their black and white stripe teepee:) such a fun giveaway. Love reading your blog! By far my favorite! Is it weird to have a crush on a Pig? I'd give the piggy to my daughter Emerson, but let's be honest, it's so dang cute, it might be more for me. My daughter would be IN LOVE with that little pig!! I hope I didn't miss out on this! I love love love The Land of Nod! This little pig would be so sweet in my son Samson's room! Their toys are so much fun & their tents are the best around! love the land of nod!! the pig has been in my cart for a while along with a teepee!! 🙂 thanks for the chance! the pig! for my friend's baby! The pig! I would give it to my niece Bravery! That black rocking horse, eek! The pig rocker would be a great gift for my friends daughter! She would love it! I love the piggy and all the toys from Land of Nod! But my favorite right now is the Makes a Village Block Set. My son would LOVE that!! Our sweet daughter V would just adore this!! Love everything from the land of nod, but especially love their jenny lind doll bed! Oh the piggy, so darling! I would gift it to my sweet lil one. And Im sure it would be used at all baby and cousin playdates for many years to come. That pig is just too cute! I would love to be able to give it to my sweet niece, who made me an aunt this year! My sweet little gal would love this! She will be two in March and she absolutely loves climbing and getting into everything. I love the little piggy rocker of course but the personalized chairs run a close second in my book! I would give the piggy to my 2 year old niece Fiona! I know she's gonna love it! My almost-two-year-old son Owen would go nuts for "Piggy"….and would snort accordingly while he rocked, no doubt! I love the pig and my daughter Eva would love it! My Friend who is expecting a sweet baby girl in May!! Love the teepees and the pig rocker! My daughter, Nola, would love it! My brother raises pigs, and she adores them and loves to play farmer. We love the This Little Piggy rocker! I have been eyeballing it for months! Our (almost) 2 year old daughter, Jazlyn, is obsessed with all things pig. I know she would absolutely love this!! I LOVE the piggy & would give it to my nephew on the way! I absolutely love the pig!! I would give it to my brother-in-law's family because he has 4 little girls who would absolutely adore this! I'm in love with that pig and would most definitely give it to my little guy celebrating his first Christmas! Our first baby is due in January and this would be a perfect addition to the nursery! Love the teepees, what a fun and whimsical toy for kids! Oh my gosh! I absolutely LOVE the felt veggies! My daughter loves eating, and always plays with her friends fake food sets. I am in love with their Smore the Merrier campfire set! It would go perfect in a playroom for Boston once we move. And that little piggy is so cute! I know my little guy would love it! This would be the perfect gift for our daughter Emery on her 1st Christmas! THE PIG!! When I was a newborn, a family friend gave me a Gund stuffed pink pig. Anyways, it was my favorite, go-to stuffed animal, had to have it everywhere. It is so worn out but yet still so cute, I have it for when I have a baby, to put in their nursery. So the rocker would be perfect!! For sure would go in the nursery! We would love to win this little pig from Land of Nod and Little Baby Garvin! My hubby and I are currently in the two week wait during our second IVF cycle! After struggling with infertility for a few years, we started our IVF journey in September with an unsuccessful cycle and thought what better time of year to try again than "the most magical time of year". We will find out on Christmas Eve if we have achieved a Christmas miracle of our own, and receiving our first baby gift of this little pig rocker would be so perfect! As life-long Iowans, this little piglet would be a fitting addition to our family name….the Piggott's. Ha! 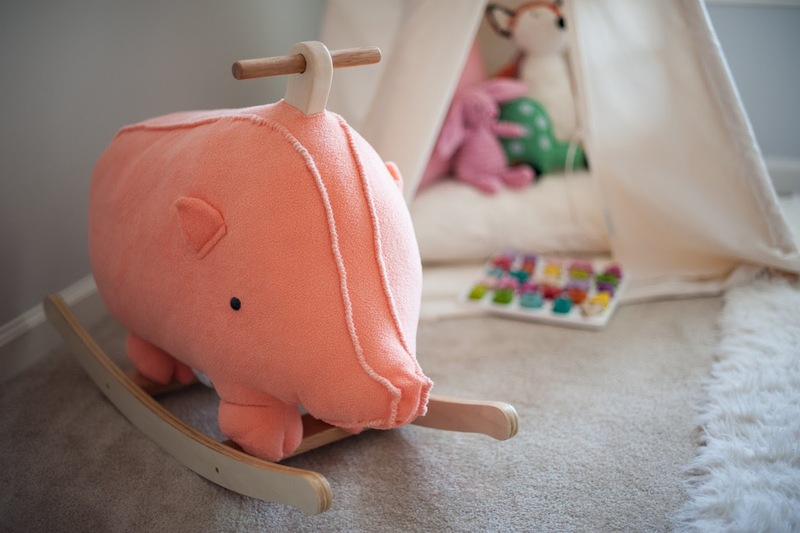 My 16- month old daughter would absolutely LOVE this piggy to ride on, so I would choose this Land of Nod toy for her!! I WANT THAT PIG!!! Haha, my daughter is finally big enough for some fun toys! This would be perfect for her first birthday! Pick me pick me!! We got my daughter a play kitchen this year!!! I love love love that fruit! Pick me!! I would give the pig to my baby cousin, who won't be able to appreciate it until she's a little older (she's 6 months old right now), but it would match her pink room! I love Land of Nod! 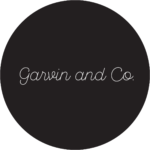 I would say our favorite items so far are kitchen gadgets for kiddos. My daughter would LOVE this pig! My niece Abby would be obsessed with that pig! How adorable! We don't have any Land of Nod toys yet – I'm always drooling over the website! My 2 year old daughter LOVES pigs and would squeal with delight to receive this! I know she'd love it! My absolute favorite toy from Land of Nod is the Little Piggy Rocker. It is adorable! My brother and his wife just welcomed their 5th child, a girl named Tessa Rose. Her 4 siblings are 18, 16, 15, and 11! Quite a surprise for our family, but such a blessing! I would love to be able to give her the Little Piggy Rocker for her first Christmas! Thank you! Holy Cow!!! That pig is A.D.O.R.A.B.L.E.!! I recently found my twin son a triceratops rocker and a pig rocker would be the perfect compliment!! The Excavator Ride On is my favorite. OMG! I LOVE pigs…and Land of the Nod. I just ordered the fuzzy girly boots for our daycare mommies daughter. Love them. I would give this little piggy to our 6 month old son for Christmas if we won!!!! I would LOVE the pig to be one of the first things in our nursery as we wait for our adoption placement! Our son is obsessed with construction stuff! I need to learn the names of everything…I'm sure he would love the Land of Nods Excavator Ride on! Our 2.5 year old daughter would LOVE the pig from the Land of Nod. Not only is she obsessed with all things animal but anything she can ride on and take for a "spin" 🙂 We adore all of the goodies available at the Land of Nod. Happy Holidays! My favorite Land of Nod toy is definitely the Black and White Tee Pee. Unfortunately, we have no where to put it. My 18 month old daughter would absolutely adore the pig rocker though. Awesome gift! We're having twins in a few weeks so this rocker for Christmas would be the perfect addition to their nursery! We love the canopy tent! My sweet 2 year old would love this piggie!! The pig would be my choice! I would love to give it to my niece who will be born in less then two weeks! The pig is so adorable! I would love to give it to my niece who will be born in less then two weeks!! Love the fruit and veggies! Love land of nod. When you're daughter says her favorite animal is a hippo you can count on them! I think both my girls, Lucy (1) and Caroline (3), would love that pig! I have 2 girls, 2 and 9 months! They would go crazy over the piggy! eeekkk! My favorite thing currently are the tee-pees. But who am I kidding, I love everything from Land of Nod. Without a doubt, this pig would have to go to Harper for her playroom! I can see her climbing up on it now saying "ride Mommy ride". LOVE the PIG! And I think my 16 month old daughter, Molly, would also love the pig for Christmas! My daughter, Lucy, would LOVE this rocker. Her favorite things to play with at the moment are her "piggies" (on her feet :). I love the little Piggy and their teepees! I would send it to my niece for Christmas!! That pig rocker is adorable. I have two young girls as well and they were get a kick out of it. We too got our girls a play kitchen for christmas. I adore those felt fruits and veggies and they would be perfect to go along with it. I would give the Pig rocker to our daughter for Christmas! It would be her first riding toy and match her bedroom perfectly! So many things to love on that site! My favorites are the olive green teepee and the Greater Pyramid blocks — my son was five weeks yesterday, so he has a bit of growing to do before he can enjoy them! My year and a half old would go nuts for the pig! Love your blog, and love Land of Nod. Merry Christmas! The pig would be perfect for my sweet baby girl's 1st Christmas! Am I too late!? I love the Tee Pees at Land of Nod! I LOVE the pig, and so would my 18 month old daughter (and eventually my 6 month old too). I also think the teepee is adorable! I love all their stuff!! I love that little piggy rocker and all things Land of Nod. That would be perfect in our playroom! Their tents are my favorite- especially the retro trailer! I would love to win the cute Pig Rocker! My 17 month old looooves rocking animals and this pink pig rocker would be so cute in her pink themed room! I LOVE this pig rocker! I would totally give it to my 2.5 year old daughter who would go crazy for it! I was going to get this piggy for my little for Christmas this year cuz if saw it last year on your blog and fell in love! My Ivy girl is a little fire cracker like Harper and I knew she would love it but I couldn't figure out how to get it shipped to Canada. It is def my fave land of nod toy!! Oh I love the pig! It would be a wonderful first Christmas gift for my sweet baby girl Faith. Our 2 year old daughter would love to have the cute pig in her room. I would give it to my 15 month old little one :). I adore the pig rocker!! I would love for my 17 month old baby girl to have this!! It's the piggy 🙂 and I'd gift it to my sister who's having a baby! Merry Christmas! My three-year-old Stella loves the Band in a Box from Land of Nod, and I know our one-year-old Grace would love riding the piggie rocker. Thanks for giving us the opportunity! This pig definitely!! My Son Wesley would LOVE it! We have been obsessing over this pig rocker for some time!!! My daughter would love it!!!! I love the piggy rocker!! And i know my daughter would love it also! !it would match perfectly in her room!! I absolutely love the Little Piggy Rocker from the Land of Nod. It would be so exciting to win it for my nephew! I love the Pig and the Arctic Rocker! Too cute!!! I would give this pig rocker to my son for Christmas! Perfect for a farm kid! I love the pig from land of nod! Would love the pig for my little bits first Christmas! The piggy would be perfect for my daughter, she's obsessed with pigs right now!!! Omg the pig! And I'd give it to my little girl of course!!!! She doesn't currently have a rocker! The pig has always been a favorite. As well as all of their musical instruments. My 19 month old gets so excited anytime she sees a rocking horse. She runs up to it and says "E-I-E-I-O?? Yeah! Yeah!" It's her way of asking to ride it. It's so funny and I know she'd love a rocking pig of her own! I would love love love this little piggy rocker for my son! He is totally at that age and it would be perfect in his room!! Fingers crossed! I love the toys like the marble stacker, the trucks, the food and the teepees! I know my 16 month old would adore the pig! She loves animals. I wanted to get the pig for my daughter really bad but then my in-laws bought her an elephant from Pottery Barn. It's really cute but I really want the pig! And if I won the pig, it wouldn't be like I was replacing the elephant. 🙂 There's no reason why we can't have two rockers in the house! I love all of the teepees from Land of Nod! My little one would love this rocker, thanks so much for having a great giveaway! I don't know why but it won't let me login under my profile to comment. My 1 year old would absolutely ADORE this little piggy (and I am dying to see him on it!)! I can just see him squeezing that little piggy face 🙂 But we also love the Land of Nod personalized bean bag chair and the wooden stacking burger and fries set – it's ADORABLE! I love the teepees!! My daughter is 8 months, but I'm sure she would eventually love to have one in her room for some good reading fun. Would love the piggy rocker for my 2 year old! I love this little piggy and would be gifting it to my dear friend who just had a baby yesterday. It is her second baby, and her first was born with a severe heart defect and just had a heart transplant at age 5 last summer. They deserve a beautiful gift! Their teepees are so darling! this little piggy needs to go wee wee wee all the way to my home! lol. My 15-month old son would love this! I love this pig and he would go to my daughter!He (totally) fits in her nursery so well! Their teepees are amazing! I would give this adorable pig to my niece! She would love this!